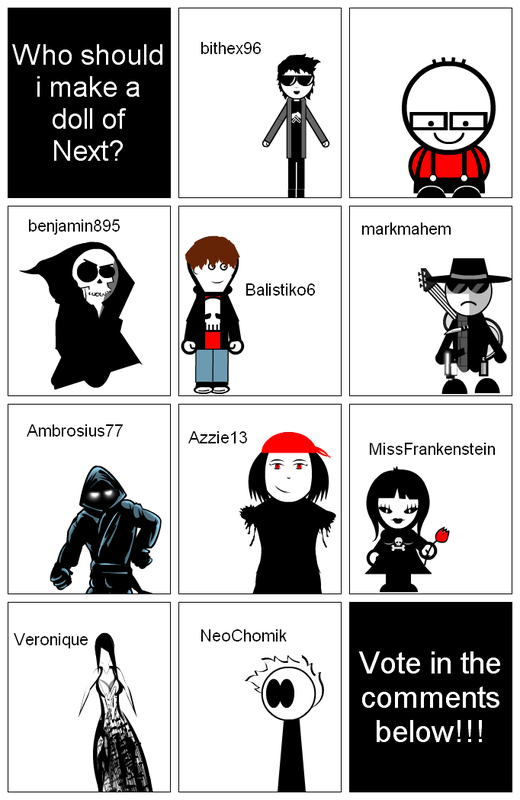 Please don't just vote for whoever's avatar looks the most awesome.Vote for who you think deserves to join the rest of us and be immortalized as a stuffed animal or stuffed version of themselves. This strip is a reply to Chibi General Grievous, Interview With Santa, My wish to all SG friends, French toast, A-770, SRR Prep 002: Story, merry xmas veronique!, to dear Veronique, More Crackers, THE ENDING, 12-21-12, Merry x-mass, Cuando era niña, the Maya, history players: Edvin van der Sar, Take the Damaged Heart, And the name of the band is...VII, Quincy & Quincy: Joke? Who should i make a doll of Next? Vote in the comments below!!! My vote actually was Balistiko, but Benjamin would look like an awesome doll too! I have no opinion but I can't wait to see the results.